Let me ask two questions and it's important to answer both before you proceed. (1.) Do you have children? (2.) Do you want them to be involved in agriculture? If you answered yes to both questions and your children are in middle school, you might want to consider moving to Spencer, Indiana for a few years so your offspring can attend Owen Valley Middle School. Sooner or later, your children will bump into Jeff Sherfield, a teacher in the finest sense of the word, who will help them become excited about the Ag business. If they spend a semester in one of his classes and DON'T get excited, well, they're probably destined to move to New York City when they grow up and get involved in something mysterious and urban. At least you'll be able to shrug your shoulders and sigh as you tell your friends that you tried. Sherfield is the kind of teacher I wished I had in middle school. He's not a man to throw a class book at you and expect you to memorize whole passages. When he teaches, he looks for ways to make the course 'hands on and real,' to move his students from a dry classroom to experiencing 'life its own self' as Dan Jenkins titled his semi-non-fiction book about football years ago. It was while teaching a course in agriculture that he began looking for ways to make the daily lessons a little more than dry book learning. 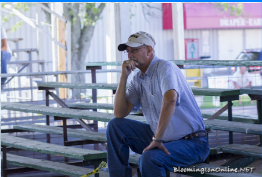 As a cattleman, he wanted to bring animal agriculture to life for his students. So he found a way to buy a steer and a hog and make it a class project that will show students the route from live animals all the way to the supermarket meat case. You can't get anymore 'hands on' than that. Q. Before I ask the important question, tell me about your job and your ag background. A. I'm a Purdue University Agriculture Education graduate of 1976 and completed my Masters in Agriculture Education in 1981. I am in my 32nd year of teaching with seven of those years as a building level administrator. I currently teach at Owen Valley Middle School. I teach one semester of Agriculture to 8th grade students and one semester of Computer Applications to 7th grade students. Q. You're involved in an interesting class project - buying livestock with your middle school students. Here's the important question: What was behind the decision to start this program? A. First we are actually not going to raise the livestock. We plan to purchase a fat steer and market hog. However, for several years I have always taught a section on meat and meat retail cuts. This was done using Power Point and having students assigned a cut of meat to research. At the conclusion of the project, students would bring in that cut of meat and we would have a cookout during the school day at the end of the project. I felt like we were leaving a lot of the process out. Obviously that animal was purchased by a packer as a fat and then processed. My students missed much of the process of market to meat counter. I wanted something more than just going to visit a local processing plant. I want students to take ownership, from buying the animal, viewing the actual processing, learning the retail cuts, and marketing the meat. I've always believed the more you can connect your classroom to real world you create a better learning environment. Q. Your program was funded by a grant that will allow you to buy that live market steer and a live market hog. Tell me about the grant - how did you apply for it and who was the good Samaritan that awarded it? A. I had searched for a year to find the right grant for the project. We had an opportunity with McDonald's but one of their stipulations was that it had to be within the building. Obviously that wouldn't work. I saw an article in our local paper about Western Indiana REMC out of Bloomfield, Indiana having some grant money available. I got online, prepared the application form, retrieved all the required signatures, information, and with my building level principal's support I applied. On Saturday, April 5th I was invited to their annual meeting to accept the $1,400 to purchase the animals this coming fall. Q. Give me a course syllabus - what do you hope the students will learn? Will you be able to complete the project in one school year? A. Since this all came about so quickly, I haven't developed the actual syllabus yet. However, I would hope my students will be able to study markets to understand what the animals should bring per pound. Some students will attend and learn how an auction works. All students will learn the steps in the processing, the cuts of meat, what the by-products are and how they are used, and steps in marketing the meat from our animals. We will begin this project as soon as school starts next August and plan to have it completed before Christmas. Everyone would like farm fresh meat for the holidays! One other thing that I expect from my students, which isn't required of the grant, is to prepare a Power Point presentation of the important steps to the end result. I would also hope to involve our school's student newscasters' team assist to produce of a video of our project. Q. When it comes time to harvest, where will you take the animals and will students be involved? A. Selected students will be taken to an auction to purchase the animals after they have determined market values. Once the animals are purchased, I will haul them to the local processors. We are fortunate to have two local family-owned processors. Fender's and Rice's meat processing, that were more than eager to assist. All students will be visiting the local processors to view all the steps in slaughter. I'm expecting with this age group we may not see the actual kill, but my intention is for students to see the rest of the process. Q. Is this a project that can continue in the future? A. One of the things I really wanted was to do something that might be self sustaining once we got our start up money. One of the major goals is to make sure, through our marketing of the meat, that it generates enough revenue to continue this endeavor year after year. I think my students will learn how important marketing and pricing of products are to the economic bottom line. I know it has created positive remarks from other teachers in the building and some have already asked to put them on the list for some of the meat. I'm really looking forward to fall and the excitement and learning this project will generate. Through the years, one important thing I've learned is the agriculture community rallys around positive projects like I expect this to be.